Automation of jobs is discussed as a threat to many job occupations, but in the UK healthcare sector many view technology and automation as a way to save a threatened system. 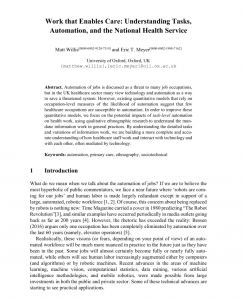 However, existing quantitative models that rely on occupation-level measures of the likelihood of automation suggest that few healthcare occupations are susceptible to automation. 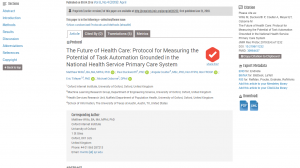 In order to improve these quantitative models, we focus on the potential impacts of task-level automation on health work, using qualitative ethnographic research to understand the mundane information work in general practices. By understanding the detailed tasks and variations of information work, we are building a more complete and accurate understanding of how healthcare staff work and interact with technology and with each other, often mediated by technology. Willis, M., & Eric T. M. (2017). Work that Enables Care: Understanding Tasks, Automation, and the National Health Service. In iConference. Sheffield, UK: Springer – Lecture Notes in Computer science.